In 1986, Finbarr Corry visited Jim and did an article on the car which was featured in one of his publications. During the rebuild, Alan and his father, Alan Snr, helped with the fabrication side of the restoration work. Sadly, Jim passed away in 2000 and the car was sold back to Ossie where it remained until 2009 when Derek Wilson purchased it. 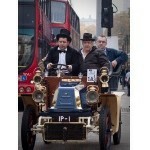 A full restoration was undertaken with the plan of competing in the 2011 London to Brighton run being the aim. Unfortunately, this didn't happen but a concerted effort ensured it took its place in this years event ensuring it reached Brighton this time. 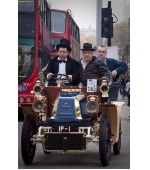 I had a nice chat with Derek Wilson in Regent Street, London on Saturday 3 November 2012 when his car was on display with a large number of the other vehicles who were due to participate in the London to Brighton run the following day. I would like to get back in touch with Derek and I was wondering if someone could send his email address to me at my email address. I have forwarded your details to Derek and I'm sure he'll be in contact with you. I have come across a photograph of this 1902 Bolide and there are a number of similarities from what I can see to an early chassis I am trying to identify, which also has an 8hp DeDion engine fitted. Could you please pass on my details to Derek Wilson as any help he can give me would be most welcome.